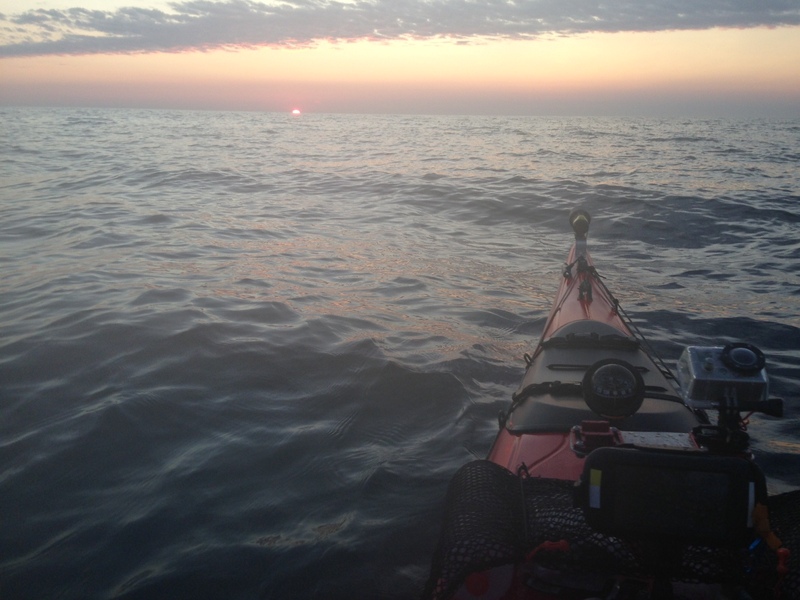 Reaching Dawn: Long Paddle or Epic Slog? I’ve not had a send-off like this in a very long time. It’s usually a variation of driving to the airport and meeting my team at basecamp. 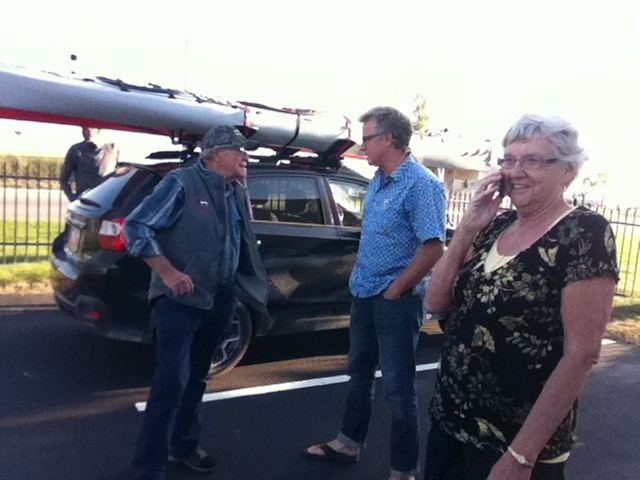 Today it is my parents and sister’s family helping me load our boats onto the ferry and driving me around. I feel almost famous. My brother-in-law, Roger, will join us on the ferry to help us get started. I’m nervous. The lake represents a terrain that offers no options to hunker down or to wait out a storm. Once we launch it is either paddle to our own destiny or get rescued. It weighs heavy on me and I try not to burn through my energy reserves worrying. 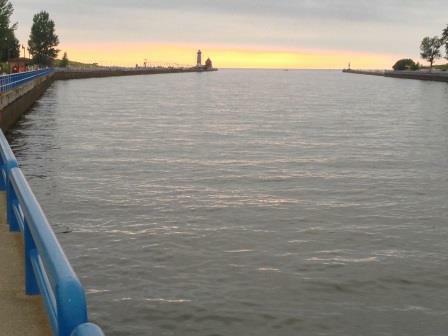 Dave, from the start, has said weather forecasting on the lake is consistent and accurate. I’ve never thought to question it, but the expanse of water in front of me has me questioning everything. 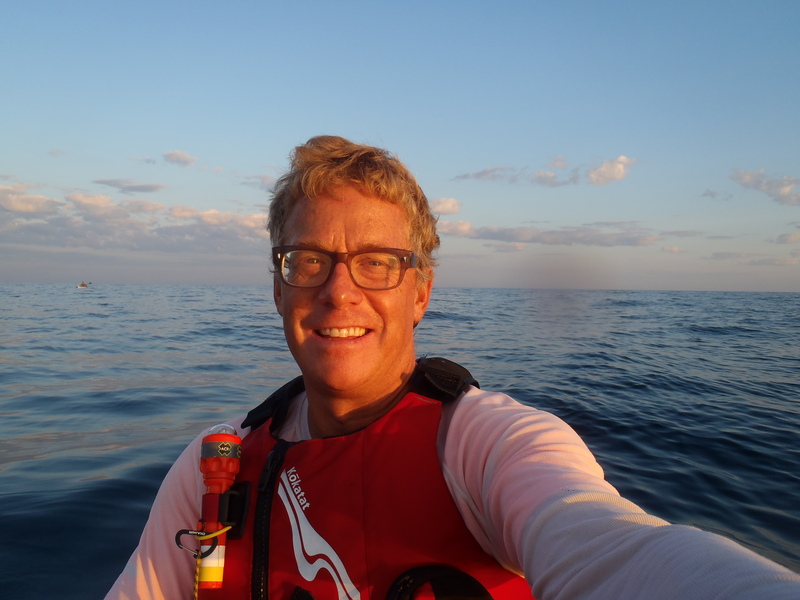 The difference between 2’ and 4’ waves, headwind or a tailwind, and rollers verses whitecaps bode our trip as a long paddle or an epic endurance slog. I’m simultaneously impatient and dreading the start. Attempting sleep on the deck of the SS Badger. In another scenario the ferry ride would be wonderfully relaxing. The passengers enjoying the trip crowd the bow deck to watch our departure. 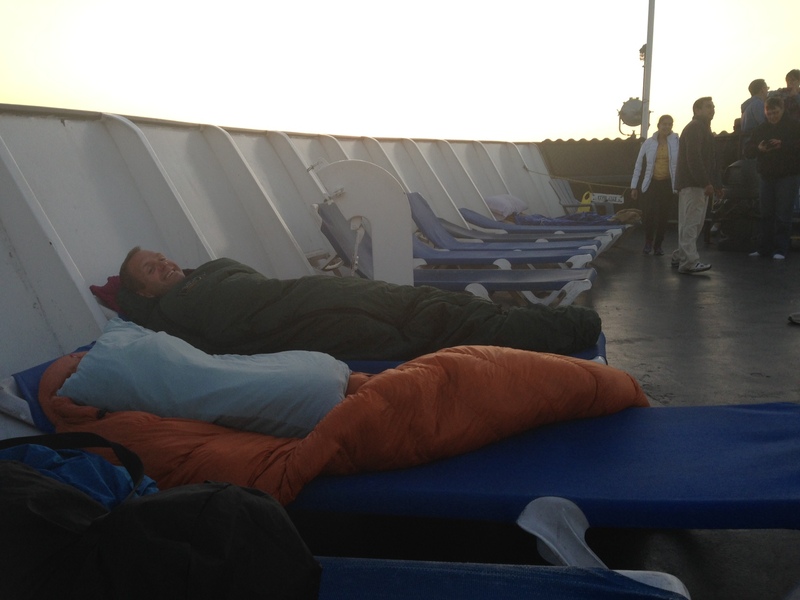 Dave and I organized our sleeping bags on the deck chairs and tried to sleep through the 4-hour cruise. I may have slept but not much. I was obsessed with trying to feel wave height and conditions through the ride of our 6650 ton, 410’ ferry – then trying not to!! The ride felt smooth and when I looked at the water it looked good – from 5 stories above. Our launch is 200’ from the ferry dock. Ferry porters carried our boats to a small beach full of shells, still in the harbor. I practiced and rehearsed rigging my boat a dozen times to be sure I would be fast and not forget a thing. 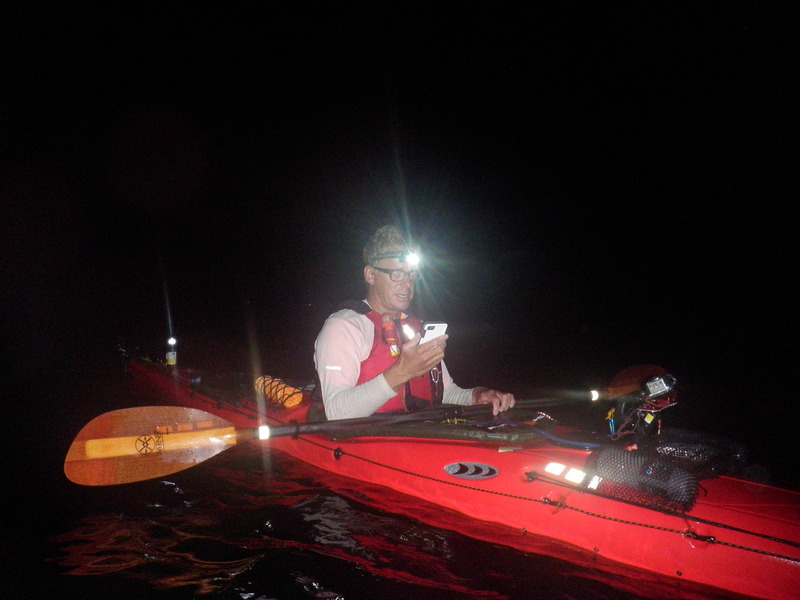 Dave was done and waiting in the water as we finally started at 12:15 AM, Wisconsin time. Dave readying his boat for launch with Roger’s assistance. I feel solid in my boat in the smooth of the harbor. I have a GPS mounted to the deck in front of my cockpit and a traditional compass near the bow. Food, rescue gear, and extra clothing is stowed thoughtfully around me so I can reach it in all conditions. I know I am rested but have only speculation on what the next 24 hours holds for me. At the end of the harbor pier the waves show themselves as more than the ‘less than one foot’ forecasted. 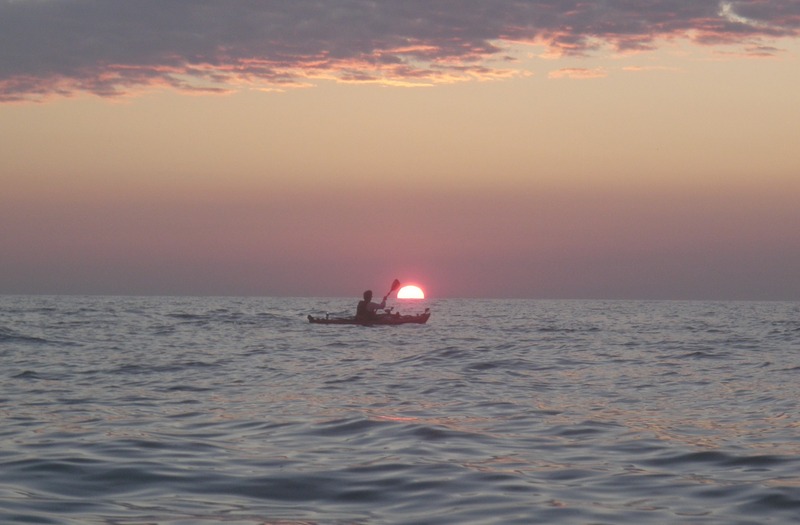 They are not tricky or abrupt but far from the smooth paddling conditions I had envisioned. Dave took off quickly. I’m a slow starter with an option for a strong finish. Many of my friends sprint out of the gate and settle into a pace a ways out, turns out Dave does too. The black water, rolling waves, and paddling away from shore has me fully sketched. I am scared and scold Dave to stay close to me, not to paddle too far ahead. In January, Dave told me I needed 100 hours of paddling to be ready, have a solid kayak roll, and to be able to exit and enter my boat in open water. One and three I achieved but a roll was only 80% in perfect conditions. I was strong enough but only fooling myself when I weighed the consequences of being kicked out of my boat. Consuming fear subsided as I realized we were making almost 4 mph in these challenging waves. Just after passing the 5-mile waypoint Dave asks me if I am feeling seasick. No, I was fine. Still running through my mental reserves at too rapid a pace from apprehension but nothing on the seasick front. Then I asked – Are you? Yes. I’ve never been seasick. I didn’t know if this was a minor inconvenience or debilitating. I figured Dave would tell me. His pace drops and I wonder what I am doing here. 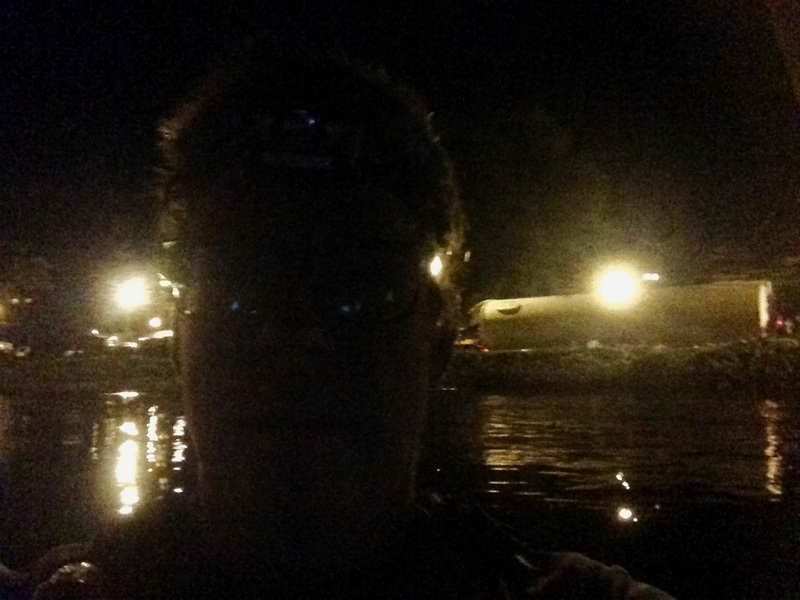 I’m confident even if things got weird 5 miles from shore was not too crazy. It didn’t make sense and certainly wasn’t founded in reality. But for some reason I was not additionally scared about the seasick development. My mind is fully engaged in panic management. Logically everything is fine. I’m feeling and paddling strong. The waves are not devious. Laughing nervously I remember I am actually afraid of the dark. I hate being in the woods in the dark and quite possible live in the desert to avoid shadows. Everything I do is focused on the time and space I am in. I have not yet made any thoughts about turning around. Navigating by GPS in the dark. 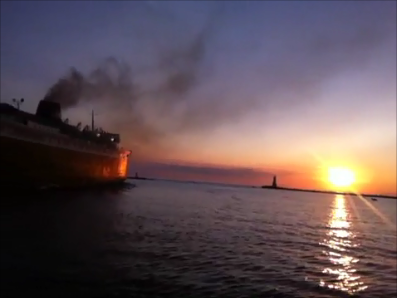 Our ferry has snuck up behind us on it early morning return to Ludington. I have been petrified its wake would roll me out of my boat with rouge 6’ waves. Instead its lighted presence brings comfort and I wish it would slow down. We use it as a navigational beacon for the hour we can see it steam away from us. Mile 10 waypoint has me wondering when it will get light. Three hours in and 3 more hours til dawn. Dave is clearly struggling with something but communicates little. We have both taken Dramamine. He now stops every few minutes to rest. I am quiet and getting very sleepy. Eventually we talk about his seasickness and he admits things are very grim. He is much more experienced than I in open water so I follow his lead. Before mile 15 waypoint I lose cell phone reception to RJ, our spotter in Ludington. I am getting weirdly sleepy and my stomach is feeling wave weary. Dave is struggling big time but I lose track of his dilemma as mine surfaces. My arms are barely moving and I struggle to stay awake. As if I am looking at a bad dream from above I wonder how long I can stay upright in my boat. Maybe if I can keep my arms moving I will not fall out of my boat. Then my whole digestive tract throws me a curve and insists I respond by exiting my boat or finishing my paddle in stench. I want NOTHING to do with getting into the dark water. Sequential time with its equally sized minutes ceases to exist. When my guts are twisted minutes are infinite, when I am wondering how long I will stay awake they pass instantly. I’m in survival mode without a real crisis but there is nothing to temper my experience. Then I get seasick and have no energy. Finally, light shows on the eastern sky. It is an hour earlier than my expectation, and I am overwhelmed. Dave didn’t seem to be suffering quite as much but I still couldn’t shake my lack of energy. If something didn’t change I was out of the game. There was no way I could finish in this condition. 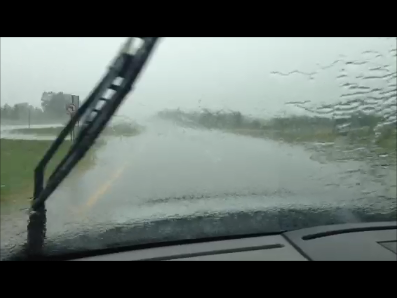 At 15 miles out retreat sounded pretty bad as well. I finally dared to jump out of my boat. I stayed in the water for several minutes and after climbing back into my boat was relieved to find I had left all my ailments in the lake. My anxiety and seasickness had distracted me from properly keeping up with food and liquids so I forced myself to catch up. The waves settled to almost calm. We were one third of the way. It was a smooth four hour ferry ride to Wisconsin. Dave and David took advantage of a nap in their sleeping bags on deck chairs on the bow of the boat. After unloading their boats in Manitowoc, they are ready to disembark. “It’s mighty dark and mighty calm. I’m glad for one and not so glad for the other,” Dave said. The deck of the SS Badger. 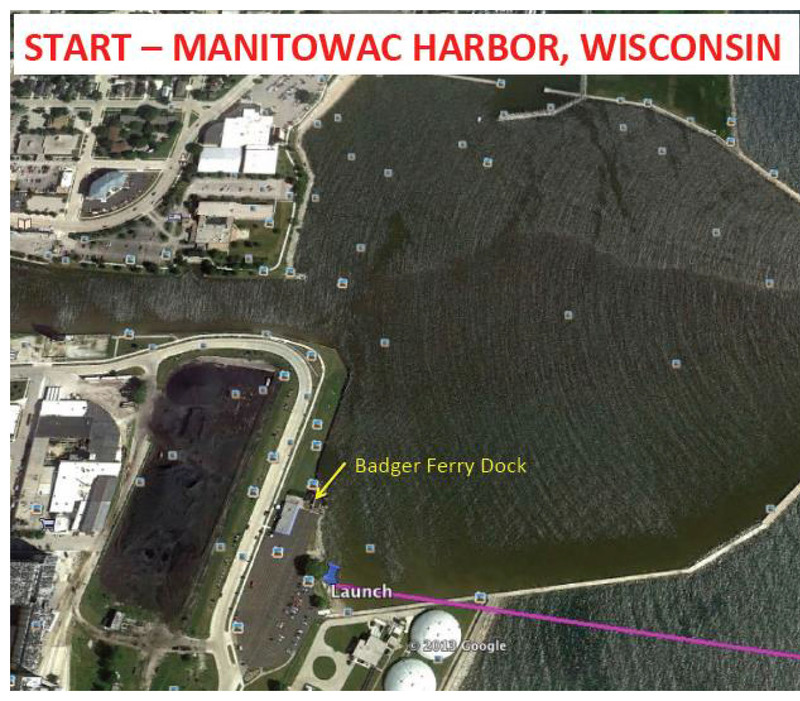 Manitowoc Harbor, the ferry landing, doubles as the boat launch. Message from the family: Dave and David just got on the water and every thing was going great! Dave sounded really exited and enthusiastic. DS: We are at check point one, 5 miles in. ” Here is a word from our sponsor and fearless leader” Dave Dejong: “Hey”. How is that for a deep meaning? Check points are every five miles for the span of the lake. GPS will help keep the paddlers on course. GPS coordinates define the route. After a long wait for good weather and optimal conditions, Friday is a go. 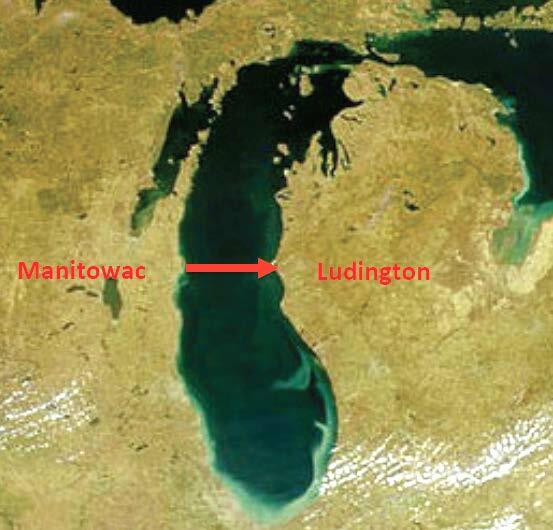 The paddling route from Wisconsin to Michigan. 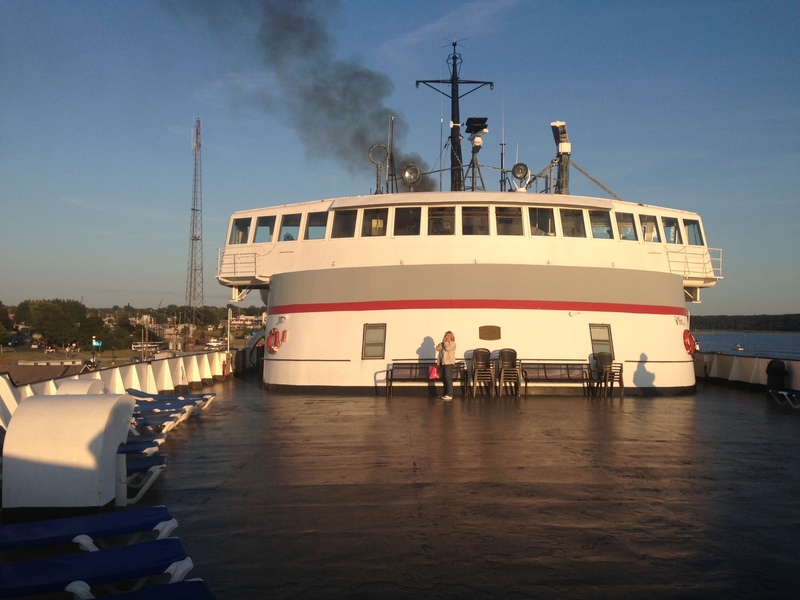 The ferry promotes, “The four-hour, 60-mile cruise between Manitowoc, Wisconsin and Ludington, Michigan has all the comforts of home and more. The 410′ S.S. Badger carries up to 620 passengers and 180 cars, tour buses, RVs, and semi-trucks”…and two kayaks. 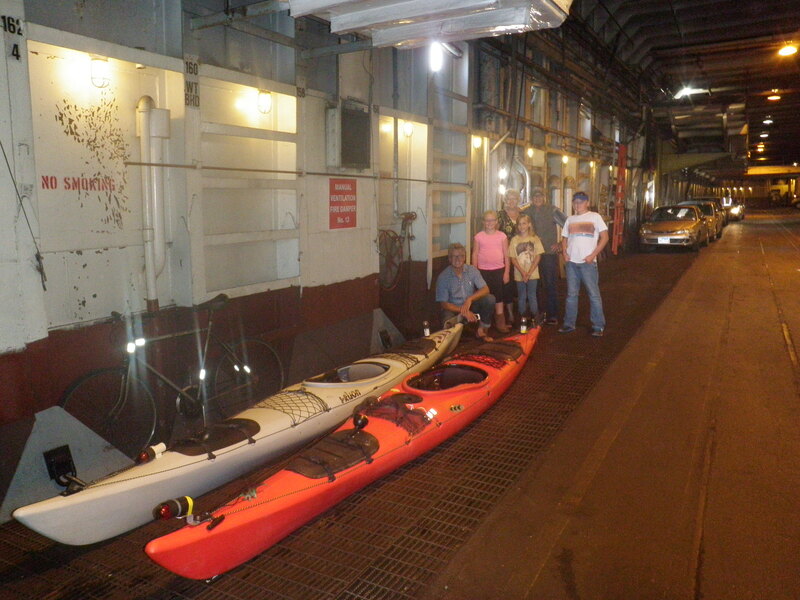 The Daves with their kayaks in front of the ferry. 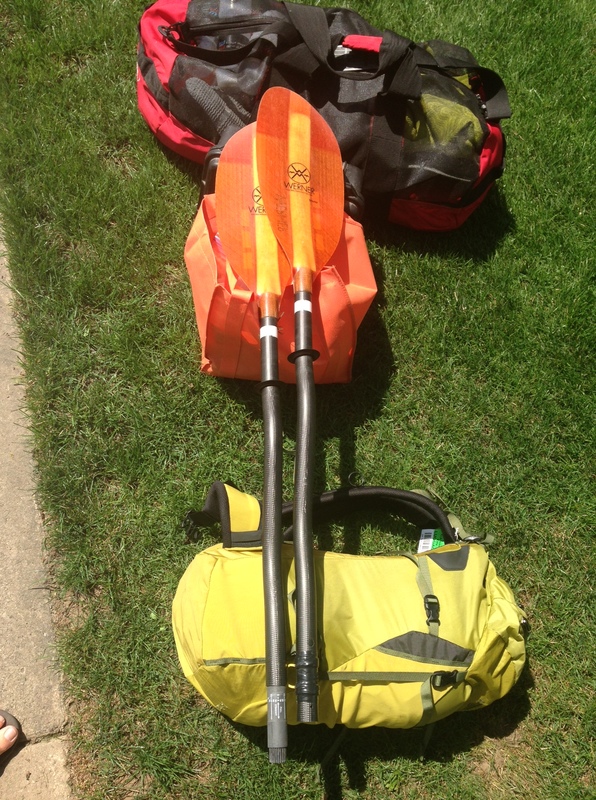 Paddle gear…just add kayak and determination. David Schipper, Age 51, 200 lbs, blonde hair, caucasion. Red Prijon Kodiak kayak. 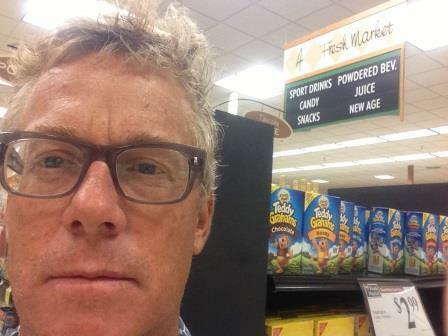 David DeJong, Age 50, 170 lbs, blonde hair, caucasion. White Prijon Seayak kayak. 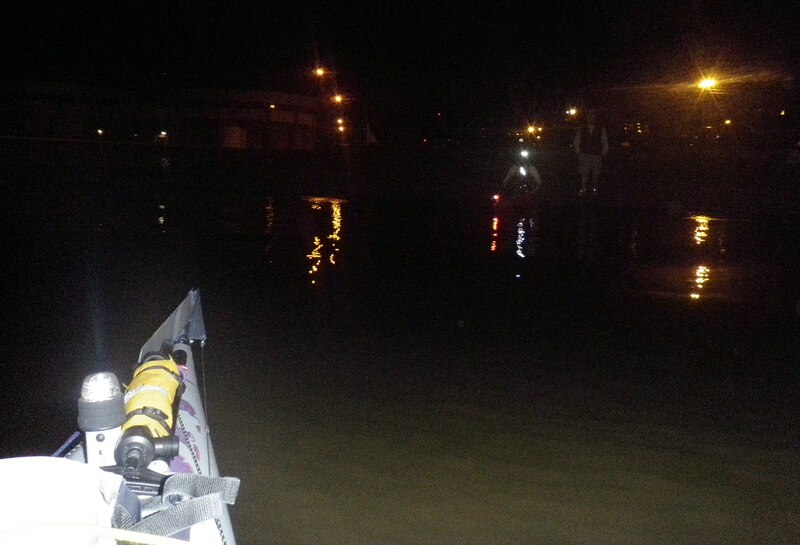 Both boats will have legal navigaConal lights. 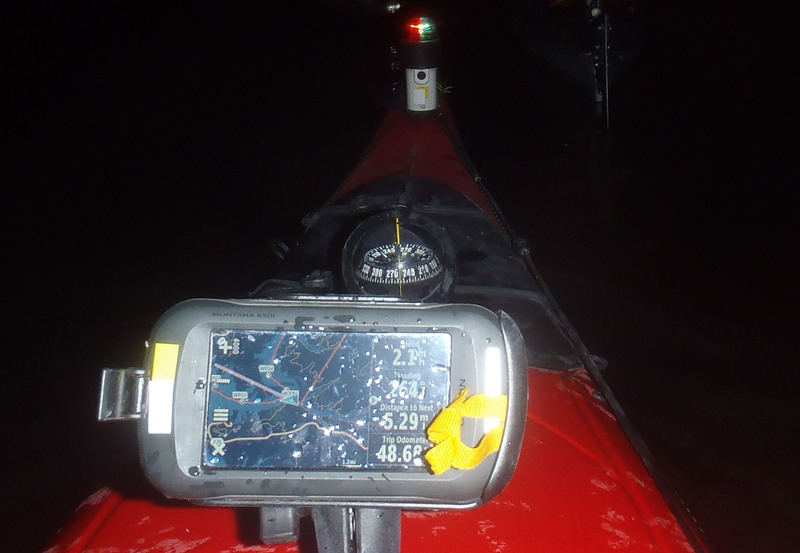 3 GPS carried between 2 paddlers. Portable VHF Marine radio enabled with GPS. I will idenCfy myself as ‘RED KAYAK’. No expedition succeeds, or is truely relevant, without support of family and friends along the way. In the waning hours of Thursday evening, the family saw Dave and David off at the ferry. 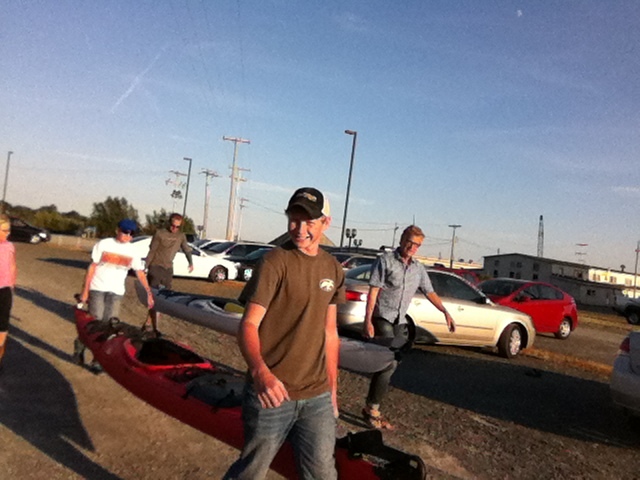 Johnny Masselink (bow) and David Masselink (stern) helping the Daves carry the boats to the ferry. A bit of Fatherly advice before launch. Dave with Mom and Dad just before leaving on the ferry. Manitowac clear sky. Half moon. The waves in Two Rivers (near Manitowoc on the shore of Lake Michigan) are 3 feet high. The wind is out of the west blowing at 1.9 knots. Ludington also clear sky with a wave height of 1.6 feet and a wind out of the south south east at 3.9 knots. The SS Badger sailing to Manitowoc, WI. About midnight I woke to thunder, and it has been raining since. 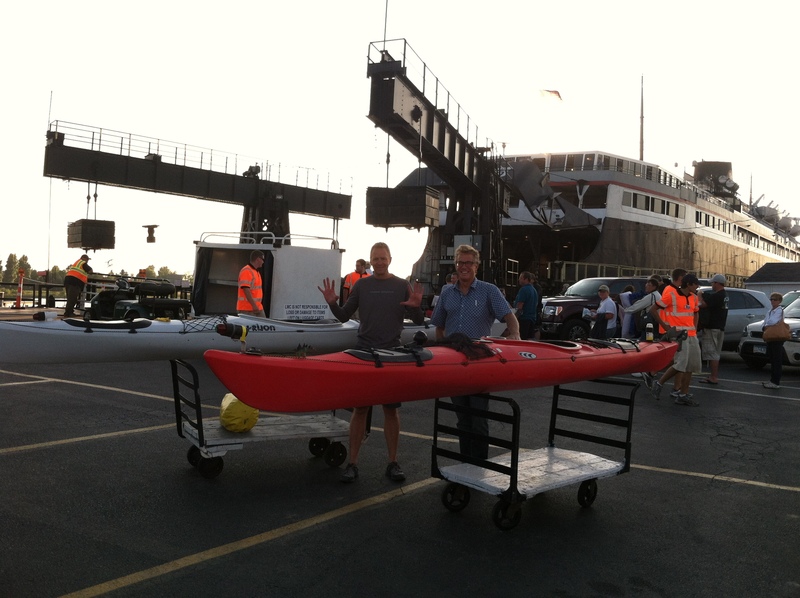 I had hoped, no planned, I would be paddling soon after my arrival to Michigan. Like I was in the right karmic place and the grooviness of my intents would keep the dream alive, and easy. Instead I am working my way through week two of a weather waiting game. Even in sunny weather waves and wind are contrary. Last night I saw perfect seas without wind during my visit to the lake. But we need 24 hours of stability and it is proving quite elusive. I’m getting a steady stream of emails from friends that have first hand experience waiting through weather to get after their objective. The anticipation reminds me of the fear that nearly consumed me when I stepped into the big mountains for the first time. Its a funny blend of anxiety and boredom. A part of me feels I am in exile. Another part likes the time with my family. My friend Doug is helping me maintain mental acuity with encouragement. And it isn’t every day I get to thank a grade school teacher for making a difference in my life. Thursday or Friday is next possible window. Checking out the New Age aisle…right next to the juice.